Graphic Operator Interface Systems for process equipment with animation for ease of operation and complete equipment control. The process is fully automatic ensuring negligible human involved errors during process. 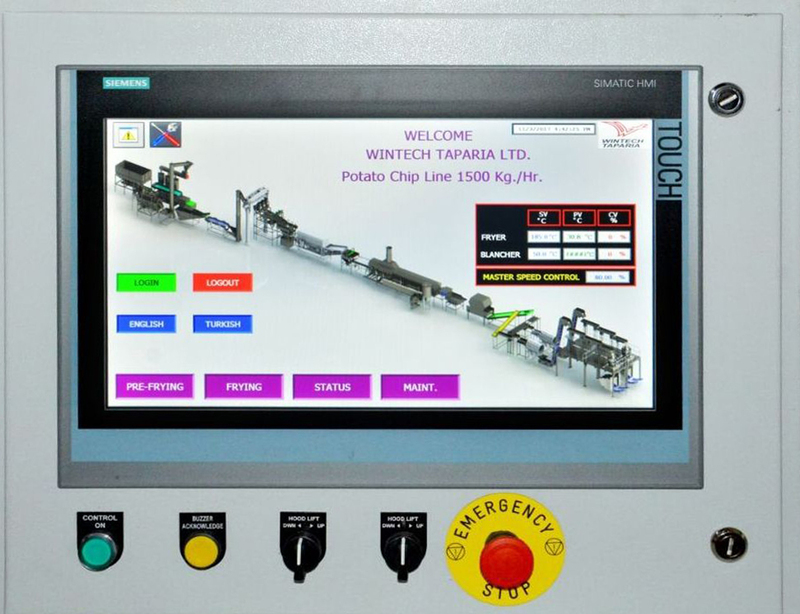 Our Programmable Logic Control systems give control of multiple machines and process functions, pre-programmed product menus, and complete data management at the touch of a single display screen. Visual fault diagnosis guides you through steps for resolving the faults, warnings and alarm generated. Monitoring of different Temperature zones with preventive measures for smoothening the process control using our enhanced PID cascade algorithms. SCADA and IOT options are also available for line’s most important metrics like remote operations , data recording and process reports etc. via mobile phone, laptop or desktop computer. Remote Engineering Service is done through internet by us to ensure preventive actions are been done by end-user maintenance team and related reports are sent directly to end-user management. All the components used are Globally available around the globe for easy replacements and are following International Safety Standards. Switchgears, VFD with EMC filters, PLC with 19 inch HMI are of Siemens/Allen bradley/ Schneider Make.